Blogging is a funny thing. Or maybe strange is a better word. Or maybe blogging is just strange for me. 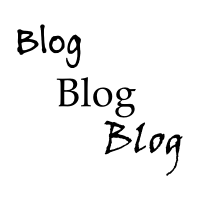 I have been blogging for a long time now. Around a decade so far (since 2007). And it seems that it is getting easier to do. I have more ideas. I have an actual inventory of pieces that I could post. And I actually have time to write. Actually, I make time to write, because I just need to write. Maybe I just do not fit into any category. Maybe I just do not fit into any box. Maybe I am a square peg in a round hole. Anyway. I mostly enjoy being a blogger. Writing and writing and writing just to write. And hopefully gaining a few readers now and then is okay with me. But sometimes I wish that I was more focused and could just write in a specific genre or about a specific topic. But I guess the opposite, not being focused, is why I called my blog Musings in the first place. I just muse about whatever comes to mind. I just write without thinking. Or without thinking too much. Well, I guess that is about it. When it comes right down to it, I wish I was funny and I wish I was focused and I wish I was an expert on something about which people would want to read. But alas. I am merely a blogger who likes to muse about life. So I muse. No wonder I think blogging is a strange thing. At least for me.